A family business now in the third generation, our house stands for a special combination of modernity and tradition. We are today a personally run, modern and comfortable town hotel, where you will love to stay. The bright and spacious rooms are tastefully furnished and every guest is greeted in the morning with a fabulous breakfast. Price and service are always in the optimal ratio. Come visit and see for yourself. Starting from 1921 the house, built in 1889, was run as a restaurant. Elizabeth, who was the landlord and also the grandmother of the present owner, gave a portion of the food from the kitchen to the needy in the town. This charity brought comparison to Saint Elizabeth of Thüringen, who resided in Wartburg Castle. The names “Elizabeth von der Wartburg” and “Zur Wartburg” were soon in common use in Wiedenbrück. In our hotel you will stay in modern standard or comfort single rooms, comfort double rooms or our junior suite with an extra large bathtub. All rooms are quiet and comfortably furnished. We have placed a lot of value on an individual and stylish ambiance, so that you can feel completely at ease and really enjoy your stay. Your day always begins with a fantastic breakfast. Crisp bread rolls, aromatic coffee, fresh fruit. Practically no wish is unfulfilled. And it is unimportant whether you get up early or like to sleep late. We serve our complete breakfast from 6:45 to 10:30 on week days and from 8:00 to 11:00 at the weekend. Your bicycle can be safely stored in our bicycle-garage! The standard rental bicycle costs 8,- € per day, or 5,- € for half a day. Electric bicycles are 15,- € per day or 10,- € for half a day. Look forward to your HOTEL ZUR WARTBURG. And a pleasant experience in a real wellness atmosphere. Besides naturally inclusive services like free parking and free, fast wireless LAN in the whole hotel, we are pleased to cover special wishes, like adding a baby cot to your room or a spontaneous cycling tour, in no time at all. Activities and sights wait for you all around Hotel Wartburg. Rheda-Wiedenbrück and surroundings have a lot to offer. Events like the Wine Market, Gourmet Market and the Christmas Market with our very own stand, exhibitions, literature events, golfing courses and bike trails. We always know what is going on. Please ask us. Autobahn A 2 Hannover-Dortmund. Exit Rheda-Wiedenbrück, direction Wiedenbrück-Stadtmitte (centre), 1st traffic light to the left, 2nd traffic light straight ahead till street turns to the right. HOTEL ZUR WARTBURG is located left side, right in this curve. Autobahn A 44 Kassel. 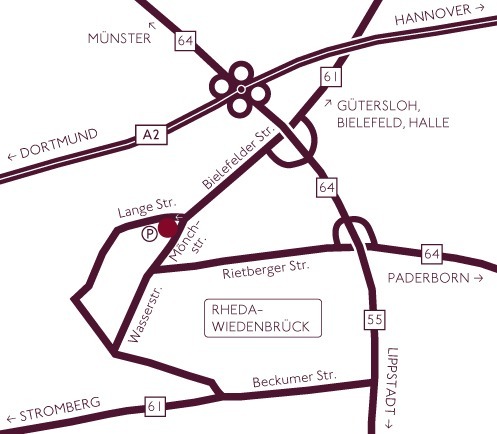 On A 33 direction Bielefeld, change to A 2 direction Dortmund, exit Rheda-Wiedenbrück, direction Wiedenbrück (centre), 1st traffic light to the left, 2nd traffic light straight ahead till street turns to the right. HOTEL ZUR WARTBURG is located left side, right in this curve. B 64 coming from Münster. Direction A 2, pass the ascends to motorway, take exit Wiedenbrück (not Rheda-Wiedenbrück) direction Wiedenbrück (centre), 1st traffic light to the left, 2nd traffic light straight ahead till street turns to the right. HOTEL ZUR WARTBURG is located left side, right in this curve.